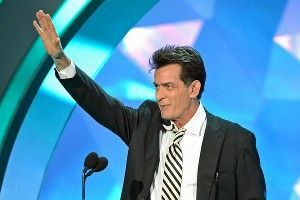 Charlie Sheen has been doing a pretty admirable job of staying in the public eye post–Tiger Blood era, thanks to a now pretty much entirely ironic career and the host of tireless enablers that keep it trucking along. A “totally random” cameo here, a frank quote about his ex-wife there — in about a year the long tail of the Charlie Sheen news cycle will have leveled off to Lindsay Lohan-grade ignorability, but we might as well ride this out. So there’s some comforting predictability in Deadline’s report today that the former Two and a Half Men star will be doubling down on ironic memery, playing the President of the United States in Robert Rodriguez’s Machete Kills (the sequel to 2010’s Machete, which, you may remember, featured Lindsay Lohan as a nun in its centerpiece bit of stunt casting). See, this is funny/”epic” (am I using that word correctly? I never know anymore) because Charlie Sheen is known for doing a lot of blow and giving crazy interviews and allegedly abusing women (that guy! ), and now he is going to play the president, which is just such an unexpected juxtaposition of ideas! What will that Robert Rodriguez think of next? Folk covers of gangster rap songs? A really biting Angry Birds joke?